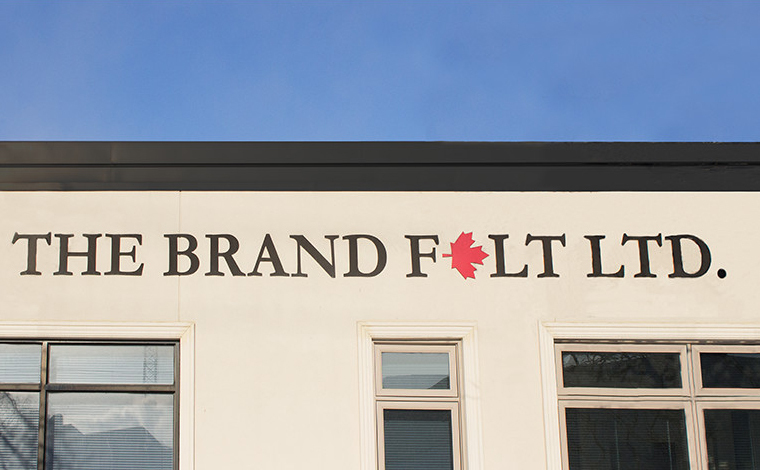 The Brand Felt Ltd. is a Canadian manufacturer of SAE Industrial Wool Felt that produces roll goods and custom cut parts to many industries in North America. We have a large converting facility in Mississauga, Ontario, with several high speed punch presses, laminating machines, re-winders, slitters, band saws, rotary die cutters, CNC machines, travel head presses and several other specialized converting machines. The Brand Felt Ltd. has expanded our product offerings to include cork, neoprene, burlap, foams, and rubbers, along with our many types of custom and SAE felt. We are proud to offer services to a vast range of industries, including automotive, chemical, steel, equine, metal fabricating, architecture and interior design, pharmaceutical, aerospace, military, furniture, display and exhibit industries to name a few. The Brand Felt Ltd. believes in fulfilling the customer’s needs through product satisfaction and great customer service, ensuring long-lasting customer relationships and loyalty. Contact us by email or phone for a free quote. To be your first choice supplier of felt, felt products and non woven textiles, Brand Felt is committed to providing high quality products and outstanding customer service. The Brand Felt Ltd. is the industry leading pressed felt manufacturer, by continually investing in technology and innovative machinery to provide the felt you need. To pursue an aggressive research and development program, ensuring our future as the leading technical felt manufacturer in North America.